Big Wheel Building: (Not) Chasing waterfalls. I am a goal oriented individual. Have been as long as I can remember. I have a hard time sleeping when focused on a project -- and since I've always got a queue of projects I'm chronically underslept. On the flip side I can be more or less incapable of getting out of bed without a firm task toward which I am driven that day. No task pressing? I'll sleep til ten. To be fair, sometimes after an extended string of 16 hour days building wheels and updating inventory, my goal for Sunday morning will emphatically be *only* to sleep in. But that's rare. Goals exist on many levels -- from the smallest things like endeavoring to ride my bike to work instead of driving, regardless of weather, to enormous, daunting, seemingly impossible tasks like trying to initiate cultural change. Often achievement of smaller goals helps to maintain motivation and drive toward the biggn's. Singular goals themselves aren't that important. It's their mere existence that motivates. I raced bikes for two decades, taking on larger and more complex missions every year. The end goal -- I can see it with hindsight, but wasn't clearly aware of it back then -- was to put all the pieces together to have a "perfect" race. Shorter races and lap races became uninteresting -- not enough variables, not enough challenge. The process began (several times each year) with months of training blocks, included all of the extrapolation and assumptions made with gear prep and route research, and continued right through execution of the event. Winning was never the goal: striving, learning, and growing were. Underlying this process was the fundamental understanding that we can always be better than we are today. I never achieved that perfect race. Came close a few times -- close enough to keep trying, years beyond when I should have stepped away. Does that mean my race career was all in vain? From my perspective it means that I spent two decades actively endeavoring to be better than I was at any -- maybe even every -- given moment. To this day I can't think of a better ethos to apply to one's existence. That same mindset still exists in my actions and intentions. I endeavor to learn, to apply knowledge, to understand. Afoot or on the bike I can no longer ignore nor hide my physical limitations, but in my boat I can still attempt to piece together some semblance of competence, and to continually improve on it. 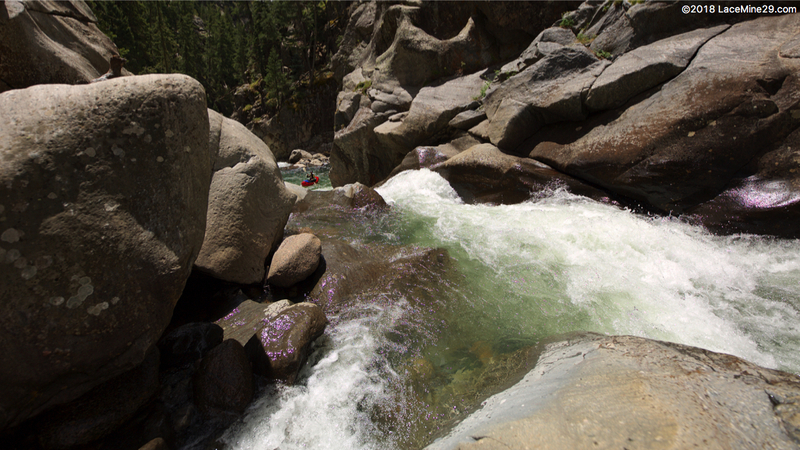 I joined John Baker, Ben Phillips, and Thor Tingey on Vallecito Creek a few days ago. 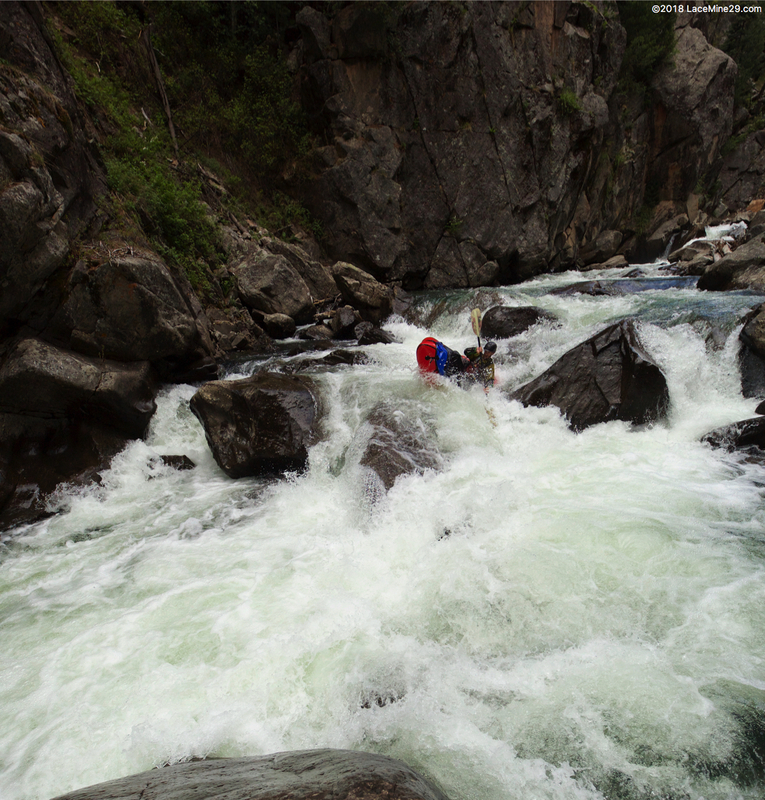 At the ~180 cfs flow we had John calls it "Easy class V". John has thousands more hours in boats than I, thus I take him at his word -- I simply don't know enough to disagree. I came to boating too late in life to reasonably expect to become competent at class V. My reaction times are too slow, raw skill non-existent, time available to devote to immersive learning extremely limited. Thus I very rarely find myself within her committing grasp. Mistakes are too costly, life already too short. Once, maybe twice a year the ingredients -- crew, flows, timing -- come together in such a way that I'll step across that line. Each time I do I am anxious, nervous, apprehensive, as well as equally grateful, humbled, and inspired. This crew is about as good as it gets from where I sit. Thor is an average paddler, about as competent as I but far more confident. I am never not impressed by his on-water persona: I know that confidence can carry you a long way but I never seem able to internalize what he exudes. Ben is an exceptional, lifelong paddler -- deeply skilled and experienced -- but a bit rusty because he has 2 toddlers and gets out infrequently. John is just stupid with how smooth he is. Witness his *perfectly* executed delayed boof at :25 of the video below for one example. I've only paddled with him a handful of times but each time I feel as though he's participating in an entirely different sport -- one filled with grace and control and poise, where by comparison I feel like I just bludgeon and hack my way through while trying to survive. It took decades for style to become a big part of the conversation in kayaking, but it’s not just about looking good. When you run a rapid with style, you are in complete control. This makes you inherently safer on the river; more likely to reach the takeout injury free and less likely to put others in jeopardy while they attempt to rescue you during a swim. As we start to push the limits of packrafting, I hope that we collectively value the importance of style. Paddling with John reminds me that I am out here not necessarily to achieve so much as to strive -- to become better, safer, more competent, all while exploring the less trodden corners of my backyard. At the same time I am keenly aware that in striving in these committing environments, there is an element of risk that can creep up and catch one unawares. When I called myself a bike racer the challenge was to take myself -- mind and body -- way beyond the limits of what I (or anyone) thought possible with frightening regularity. 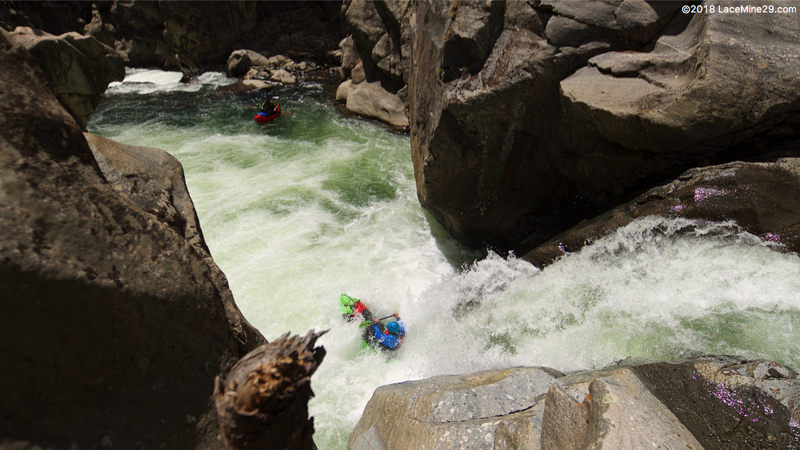 With whitewater the stakes are too high to go that far, thus the challenge has become merely to feather the edge of my comfort zone, endeavoring to learn and grow while maintaining a healthy buffer within which I can make repeatable mistakes. Running an occasional waterfall is fine, chasing ever bigger versions compulsively is not. Each time I paddle with this crew in a place like Vallecito I learn so much, realizing how far I've come, and how far there is -- and always will be -- left to go. Man, what a great bit of water to have in your back yard. A guy could get completely sidetracked from riding bikes eh. Nice job Mike! Keep chasin the dream brother. Should you find yourself on the north side, (Fort Collins), I'm always up for a Poudre run. Who was it that went backwards down that slot? Spookey to watch from a screen. And damned if it didn't look like Thor's boat was upside down and maybe empty. But I know that is an unpossiblity. That was Ben going backwards. Srsly -- he does make mistakes on occasion. Kept it upright though! And Thor did get removed from his boat at the end there.